So, you folks living in these places, tell us if you're OK, and whether you've learned that basements are Satan's work. March 07, 2017 — Minor floods caused by rising sea levels may end up costing U.S. coastal communities as much money and resources as major hurricane disasters, U.S. scientists said. As climate change causes sea levels to rise, such "nuisance flooding" is expected to become more frequent and costly for cities like Washington, San Francisco, Boston and Miami, researchers said. Over the last 20 years, Washington has endured more than 94 hours a year of nuisance flooding. By 2050, the capital could see as many as 700 hours of flooding a year, the scientists estimated in a study published in the American Geophysical Union journal Earth's Future. "Since these events are not extreme, they don't get a lot of attention," said Amir AghaKouchak, a professor of civil and environmental engineering at the University of California-Irvine and co-author of the study. The National Ocean Service defines nuisance flooding as "flooding that leads to public inconveniences such as road closures" but rarely causes death or injury. Such floods can overwhelm storm drains, slowly degenerate infrastructure and strain city resources. Roads and sidewalks were not built to be under saltwater for hours on end, and cities usually have to close roads and send in trucks to clean them up, the scientists said. "They definitely can't withstand this," said lead author Hamed Moftakhari, also of UC-Irvine. And the damage leads to "long, drawn-out costs," he added. 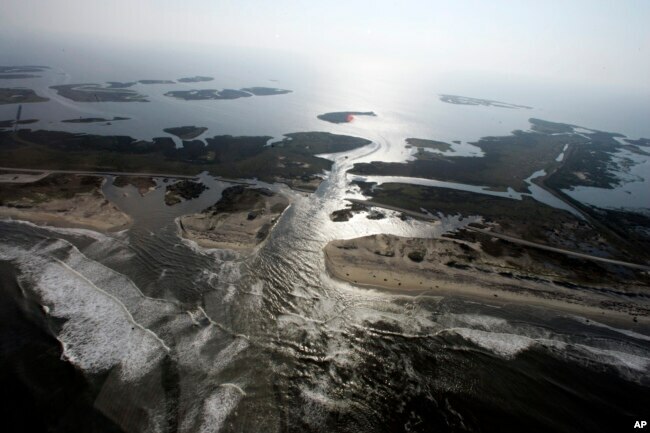 A flooded road on Hatteras Island, N.C., is shown after Hurricane Irene swept through the area, cutting the roadway in five locations, Aug. 28, 2011. Flooding caused by rising sea levels may end up costing U.S. coastal communities as much money and resources as major hurricane disasters, U.S. scientists said. In Boston specifically, "king tides" overwhelm walkways and roads several times a year. The East Coast city is predicted to see up to 100 hours of such nuisance flooding a year by 2030, the UC-Irvine scientists said. Residents have already noticed the semifrequent inconvenience, according to Mia Goldwasser, Boston's climate preparedness program manager. "There are always people sending pictures to the city, saying, 'Look at all the flooding happening with very little rain,' " she told the Thomson Reuters Foundation in a telephone interview this week. The city has already noted several waterfront hot spots where "it's going to be worse [in the future] if there's already flooding." 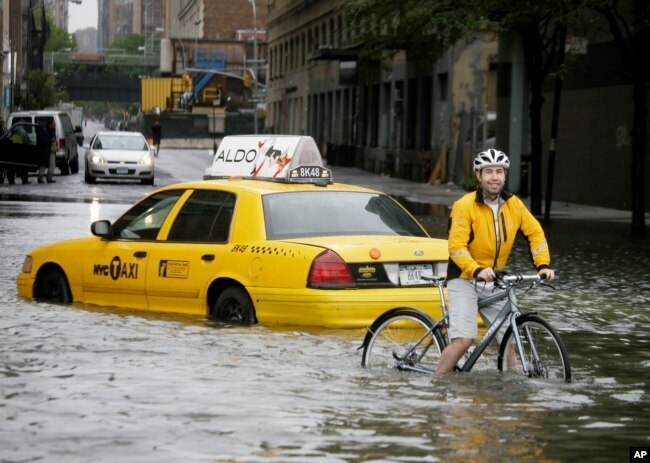 The flooding has raised awareness among the general public to the everyday realities of climate change, Goldwasser added: "It's an inconvenience to people when they're walking and driving and biking, moving around their neighborhood." The scientists are using the data as a "call to action" for coastal cities to examine the issue and decide on the best ways to respond to rising sea levels. "We believe that if you have information on the type of hazard, the potential cost, then you can plan," said AghaKouchak. Boston has begun to come up with ideas to mitigate the effects of rising seas on infrastructure, which include floodproofing properties and potentially building a massive seawall. Some roads and buildings may become corroded by nuisance floods, while others could end up completely under water, Goldwasser said. "There's still a lot that we don't know, that we're trying to figure out," she said. "What are the most effective solutions? ... How do we actually implement them?" As for the total cost of the floods over the next few decades, Goldwasser said that's still to be determined, though it's expected to be "pretty significant." May 30, 2017 — Marty Mozzo gets a gorgeous show each night when the sun sets over wetlands near his property on the bay side of a barrier island. When he and his wife bought the house in 2008, she looked at the marsh, where the only sign of water was a tiny trickle nearly a half mile away. "Do you think this will flood?" she asked. "How could it?" he replied. "Look how far away the water is." Within weeks of moving in, a storm stranded them for two days with water on all sides. Theirs is one of several neighborhoods in Ocean City, New Jersey, where residents have adopted unofficial flood etiquette: Don't drive too fast through flooded streets or you'll create wakes that slam into houses, scatter garbage cans, and damage lawns and gardens. The flooded streets of a back bay neighborhood in Manahawkin, N.J., after a moderate storm. 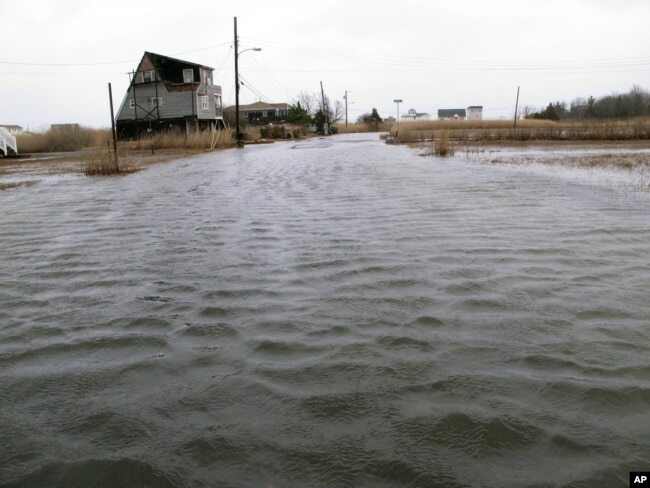 They are among millions of people worldwide whose lives and land are being dampened by back-bay flooding — inundation of waterfront areas behind barrier islands where wind and tides can create flooding during storms or even on sunny days. It's a type of flooding that tends to be overshadowed by oceanfront storm damage that grabs headlines — and government spending — with dramatic video of crashing waves and splintered houses. "This insidious flooding is increasing, and it is an important social issue, but it is not getting enough attention paid to it," said S. Jeffress Williams, a coastal scientist with the U.S. Geological Survey. "Flooding is happening with increasing frequency in back-bay areas. It happens very rapidly; it's just not as dramatic." Williams, who lives on Cape Cod in Massachusetts, said back-bay flooding is happening just as frequently, if not more so, than oceanfront flooding. "Over the last 15 or 20 years I have seen, especially when you get a full moon and a high tide, roads, backyards and parks all get flooded, much more so than we ever had before," he said. Nearly five years after Superstorm Sandy delivered a wake-up call, the problem of back-bay flooding is coming into sharper focus. Studies are under way, money is starting to flow toward the problem, and the realization that destruction of wetlands for development along such shores is partly to blame is leading to discussion about building codes. Sandy created a vast swath of destruction along the coasts of New Jersey and New York in 2012. But it also wreaked havoc along the back bays, where miles of lagoons exposed thousands of waterfront homes to flooding damage. Property owners in Toms River, New Jersey, received more than $568 million in payments from the Federal Emergency Management Agency after Sandy. Neighboring Brick Township received more than $267 million. Both towns have limited oceanfront exposure but extensive back-bay exposure, and they represented the largest damage totals in Ocean County, the region of New Jersey that took the hardest hit from Sandy. President Donald Trump's budget proposal, released last week, would cut a combined $452 million from the National Oceanographic and Atmospheric Administration and the Homeland Security department for research grants, flood mapping and analysis. If enacted by Congress, many environmental groups worry, less money will be available to study back-bay flooding.